This is interesting, because right now the Ukrainian government and IMF are tiptoe-ing around the issue of how to implement an austerity package linked to the IMF’s gigantic programme of loans, put in place after the 2008 financial crisis – which hit Ukraine harder than almost any other European or former Soviet country. The Ukrainian workers’ movement, like that in Russia, has largely been quiescent since the mid-1990s. The burden of decades of dictatorship, the difficulties of throwing off the old union structures, the effects of industry being trashed … all have taken their toll. But there’s no reason to think the movement will be quiescent for ever. Those bankers may be back collecting their bonuses, and the financial press in the west may be talking about “green shoots” – but the “real economy” in Russia and the former Soviet Union will take years to recover from the crash. The industrial downturn in Europe, to which Russia exports much of its gas, as well as in Russia and the CIS, has trashed demand for natural gas – the revenues from which are a vital part of Russia’s wealth. So in the first half of 2009, compared to the first half of 2008, European industrial output was down by about 15-22%, Russian gas sales to Europe were down by about a third, and the revenues from European sales for Gazprom, Russia’s state-owned gas company (and the country’s biggest firm) were down from $33.1 billion to $20.3 billion. In Russia itself, where industrial output suffered the same sort of crash as in Europe, gas sales were down 6% year on year. But the real disaster area was Ukraine. Its steel industry pretty well packed up over the winter of 2008-09, with workers being put on short-time or sent on unpaid “holidays” within weeks of the Lehman Brothers crash. Its gas demand in the first half of 2009 went down by nearly 29% – and that was mainly because consumption by industry was cut by more than half. I’ve argued in my paper that gas demand will get back to its 2007 level only by around 2012 in Europe, and only by 2015 – or even later – in the former Soviet Union. “Recovery” of western banks – which itself is far from assured, in any case – is a quite different thing from “recovery” for Russian and Ukrainian industry. That’s the message from Zeljko Bogetic, the World Bank’s lead economist for Russia. Even the bank, which is always under political pressure to emphasise how quickly economies can recover, is saying that as a result of the economic crisis an extra 7.5 million Russians have sunk below the poverty line, that the poor now comprise 17.4% of the population (up from 12.1% a year earlier) and that the number classed as “vulnerable” has risen by 3.6 million. 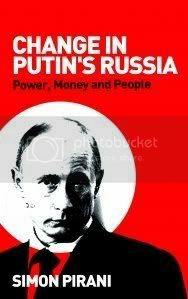 My recent article, including interviews with Bogetic and other economists about Russia’s difficulties in escaping the effects of the crisis, is here: http://www.simonpirani.com/em-oct09.html.